The W.HOFFMANN brand already existed around 1900 in Berlin! With its new piano series the manufacturing site C. Bechstein Europe establishes and underlines the ties with the German virtues of high-quality piano manufacturing. 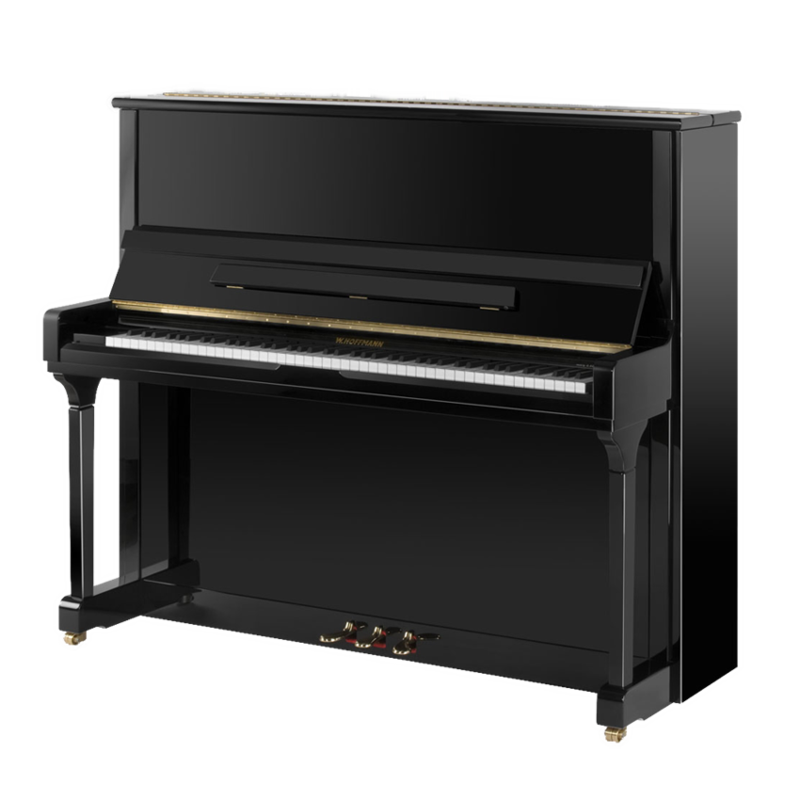 The new upright concert piano W.HOFFMANN Vision V 131 impresses through its sound character and classy look. A classic, elegant body, a big sound volume and fine capability for tone shading. You think: If a piano is low-priced, it cannot perform? We convince with facts. Manufacturing quality and valuable components. With the new, inexpensive upright concert piano W.HOFFMANN Vision V 131, the strings are held in place throughout by agraffes. The piano has three pedals (including moderator). According to German C. Bechstein tradition, W.HOFFMANN Vision pianos are voiced by hand and with the help of the human ear in individually crafted steps.Complete quality assurance, from determining and testing all components, occurs also for the upright concert piano W.HOFFMANN Vision V 131 by experienced piano makers of the C. Bechstein Europe factory. Even the back for these W.HOFFMANN Vision pianos is made of medium-hard solid wood. The sounding board core and ribs are made of spruce wood, bridges and pin blocks of hard wood. So much effort and yet this piano is inexpensive! For the hammers, noble English sheep felt is used. The hammers are voiced individually by hand and ear. C. Bechstein Europe in the Czech Republic’s Hradec Králové guarantees consistently high quality. Manufacturer’s five-year warranty covers even affordable pianos. The new Bechstein Vario System is easily installed in the W.HOFFMANN Vision V 131 concert upright piano. Thus, you obtain an acoustic and digital piano in one.